Fred has served on the Board of Directors since 1971. He has also served as Chairmen on The Kodiak Elders Council. He was raised a commercial fisherman in Akhiok, and he now resides in Wasilla, Alaska. Fred served on the Kodiak Native New Life board, Suna’aq Tribal board, and Kodiak Island Native Educators Board. 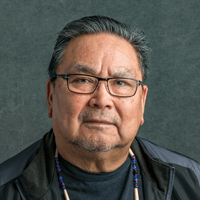 Fred currently serves on the Alutiiq Museum Board and the Alutiiq Language Club, Qik’rtarmuit/Alutiiq Regional Language Advisory Committee, Vice Chair of the Indigenous Native Music Association (INMA). He is a member of the Knik Tribal Elders Group. Fred is also deeply committed to wellness and is a stakeholder for the Kodiak Region of Rural Providers, a group that stands strong against drug and alcohol abuse, as well as childhood trauma.